So what's the secret to Thomas Jeffersons Poplar Forest retreat? Free admission for moms on Mother's Day and free admission for dads on Father's Day! Well, there's a typical moment in spy movies. The hero retreats to a special “safe house”—a secret hideout where he can hide from his enemies and formulate his next move. A view of the house from the "backyard." Note the classical Palladian elements such as the columns. 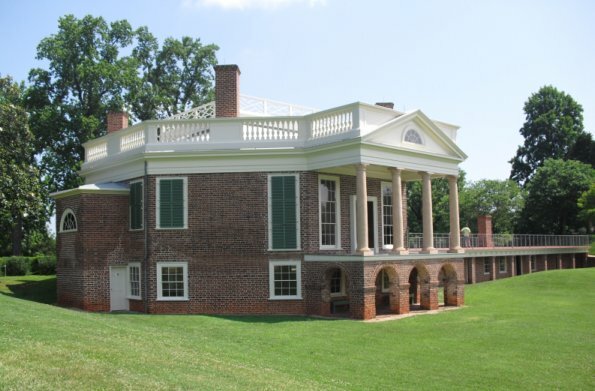 Although he wasn’t a spy, Thomas Jefferson had his own “safe house” known to few outsiders where he could retreat from the world, from the constant stream of visitors to Monticello, and even from marauding British soldiers. It’s called Poplar Forest, and it’s located in Bedford near Lynchburg, a 1-1/2 hour drive from Roanoke and Staunton. It was one of five plantations Jefferson owned during his life, and produced the lion’s share of his income as a farmer. Originally about 5,000 acres, Poplar Forest came to Jefferson upon the death of his father-in-law, although his first lengthy visit came in 1781 during the Revolutionary War. One fateful day, Jefferson received word that the British were coming to arrest him at Monticello. Grabbing his wife and family, Jefferson escaped by the skin of his teeth, fleeing down one side of the hill at Monticello as the British were coming up the other side. What “safe house” did Jefferson flee to? His plantation at Poplar Forest. It was on this two-month visit that Jefferson wrote his one and only book, Notes on the State of Virginia. In 1806, during his time as President, Jefferson began construction at Poplar Forest on what became the first octagonal house in the nation. Designed to resemble a Roman villa, the design was heavily influenced by Andrea Palladio's classical style of architecture which Jefferson had so admired during his time as minister to France. When you visit Thomas Jeffersons Poplar Forest, be prepared. Reminiscent of Monticello on the outside, there’s little obviously like it on the inside. Other than a stray table or chair, it’s starkly empty. 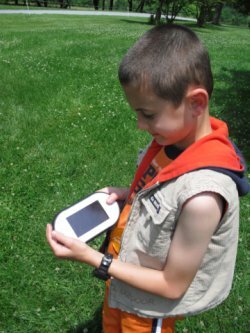 Use of a hand-held GPS video monitor is free with admission. Here’s why: After Jefferson’s death, the plantation was sold off by the family within two years. A devastating fire in 1845 gave the then-owners the opportunity to transform the building into a practical farm house, changing the roofline, putting in a second floor, and closing off some windows. By the time the house was purchased by the nonprofit Corporation for Jefferson’s Poplar Forest in 1983, the estate had dwindled to a mere 50 acres, and the house was in extreme disrepair. Since then, the Corporation has poured in funds to restore the mansion to its original state. If you look closely, you can see a few things that will remind you of Monticello, like the space for an alcove bed, and a copying machine Jefferson used to make simultaneous copies of all his correspondence (a major reason we know so much about him today). What’s most fascinating about Thomas Jeffersons Poplar Forest? Seeing the care (and millions) with which the house is being lovingly and painstakingly restored to how Jefferson envisioned it. It’s also intriguing to see photos of how the house looked in the 1960’s, to picture what it would be like to live in the home of one of America’s greatest thinkers, and to imagine what—like at Monticello—came so close to being lost to the ravages of time and the elements. Admission to Thomas Jeffersons Poplar Forest is $16 for adults, $14 for seniors and military with ID, $8 for college students with ID and teens (12-18), and $4 for youth (6-11). The admission fee includes a guided tour of the house, as well as the use of a hand-held GPS/video guide which you can view as you walk around the grounds. For $19, they offer a Combo Ticket which provides admission to Poplar Forest and the nearby National D-Day Memorial (which is normally $10 for adults). Poplar Forest is open to the public daily from 10 am to 5 pm mid-March through Dec. 30, except for these days: Easter, Thanksgiving, Christmas Eve, and Christmas Day. It is also open for self-guided tours on weekends mid-Jan through mid-March. For directions or GPS, use this address: 1542 Bateman Bridge Road, Forest, VA 24551. For more information about Poplar Forest, call (434) 525-1806 or go to go to www.poplarforest.org. A fantastic time to visit Thomas Jeffersons Poplar Forest is on July 4th. A special celebration featuring period dance, music, costumed interpreters, historic crafts, pony rides, and more family fun runs from 11 am to 4 pm. Plus, at 1:30 pm they hold a fife and drum presentation, followed by a reading of that famous document authored by Jefferson himself-- the Declaration of Independence. Admission to the event for adults is $5, while kids under 16 are free. They also offer reduced admission to the mansion. For details, call (434) 534-8120 or go to www.poplarforest.org/events. Want to Tour More Presidential Homes?